Mina Li – Robot Dinosaurs! Arden heard a car door slam and her heart thumped in her chest, but when she looked over her shoulder, the street was empty. This late at night, she was supposed to be tucked in bed and fast asleep. Instead, she stood in front of the big Rexotron 3000 statue on the park playground, his steel teeth gleaming under the street lamps in an ear-to-ear grin. Maybe she’d get lucky and Mom and Dad would be too worried about her missing twin brother Simon to go check on her. Still, she wanted to get this done as soon as she could, because the autumn chill made her shiver through her thin jacket and pajamas. Rexotron was good at finding things for the right price, but what about a person? She’d heard Danny Walters gave Rexotron his lunch for finding his stolen bike, and it’d been a really good lunch, with chocolate chip cookies and a Capri Sun. She hoped what she had was enough to Rexotron to take the case. Arden looked over her offerings for a few seconds. She hoped he’d like it—pork belly wasn’t Stego-Steak (Rexotron’s favorite! ), but they didn’t sell Stegosaurus meat at the store. And she didn’t know where to get electron soda, so the Coke would have to do. Arden put her hands together and bowed three times, just like she’d done with Mom when she visited her great-grandmother’s grave. “Rexotron 3000, please bring Simon home,” she prayed. She sat back on her heels, holding in a breath, to see if Rexotron 3000 might tell her it was okay or if he’d make that “Okay!” sign with his claws, but she had to get back in bed before Mom or Dad checked on her. They didn’t need to have both her and Simon gone. Later, when Arden had just begun to warm up under the covers, she heard a faint tp-tp-tp at her window. She rolled over, trying to shut the noise out so she could fall asleep. Maybe it was the crabapple tree tapping its branches in the nighttime breeze. Arden shot upright. That voice…it couldn’t be! She got out of bed and tiptoed to the window. Then she immediately jerked back, tripping over herself in shock over what she saw. Right in front of the crabapple tree was Rexotron himself, all seven tons of him, neon blue eyes glowing in the darkness. His teeth looked even sharper than on TV, as if they could slice a building like butter, and his red Hawaiian shirt made him look like a giant circus tent. “C’mon! We ain’t got all night!” yelled Rexotron. Arden rushed to the window, pushing it open. “Shh! Mom and Dad are sleeping,” she whispered. “I guess you’re right,” Arden said. 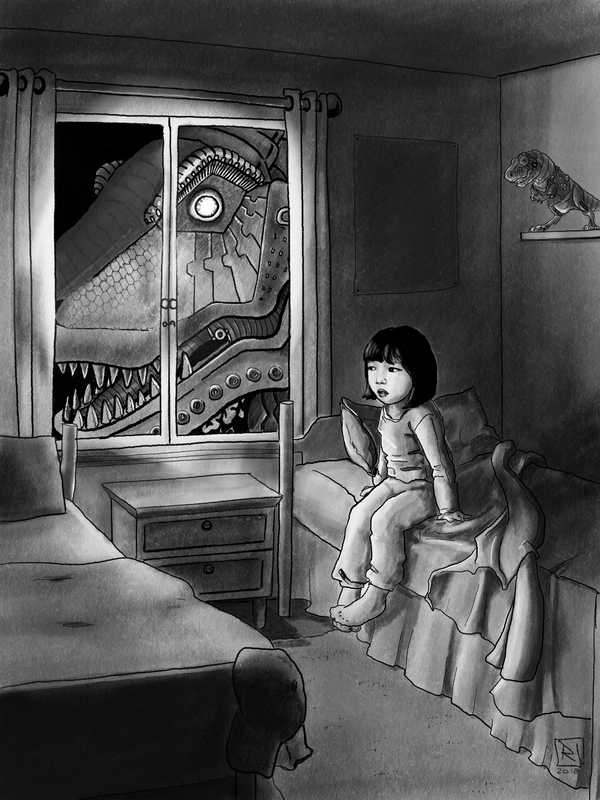 The night breeze made her shiver as Rexotron pulled her out through the window. “Will it be safe?” she asked. That was the line he always said on TV. It calmed Arden down a bit. The air around them charged for a brief second as Rexotron’s cloaking device switched on, covering them in a transparent shield. “There we go,” he said, and both of them were off, each stride at least two blocks long, faster than any car. Hold on, Simon, Arden thought. We’re coming for you. Mina Li hails from the hinterlands known as Michigan, and remembers crying her eyes out while watching The Land Before Time in kindergarten when Littlefoot’s mom died. When she’s not thinking of stories to write, she likes to try out new recipes, knit everything from socks to blankets, and take long spring and summer walks in her neighborhood. 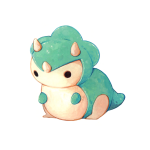 Rekka Jay is an American graphic designer, illustrator, and seamster who is passionate about wellness, books, and dinosaurs. She illustrates using traditional mediums, most often pen and marker, as well as digital. Each day she wakes at sunrise to write SFF under her pen name, R J Theodore. Her art and design work can be found at rekkajay.com. Her written portfolio can be found at rjtheodore.com. She pings as @bittybittyzap on Instagram and Twitter.